Salonina was the wife of Gallienus. Size : 21.1 x 21.7 mm. Weight : 4.75 grams. Grade : VF, well centred, with lots of silvering remaining. But the silvering is patch and so slightly detracting from the visual appearance of the coin. The grade is for visual appearance, as the coin has very little actual wear on it. 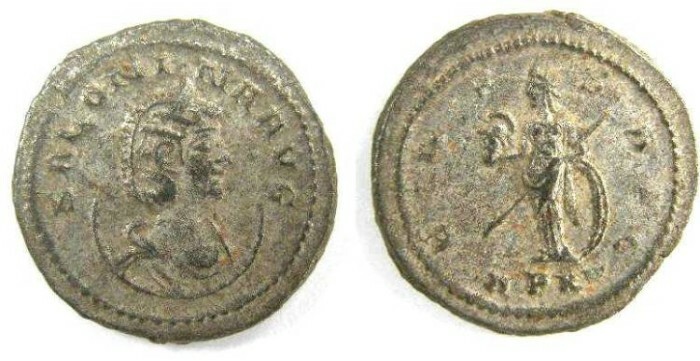 Obverse : Head of Salonina right, with SALONINA AVG around. Reverse : Venus standing left, holding a helmet, spear and leaning back on a shield, with VENVS AVG around, with P XV in the exergue. P XV is short for TR P XV, which was a title Gallienus held in AD 267. The reverse inscription is a little weakly struck.